"The New Princeton Encyclopedia of Poetry and Poetics" is a comprehensive reference work dealing with all aspects of its subject: history, types, movements, prosody, and critical terminology. Prepared by recognized authorities, its articles treat their topics in sufficient depth and with enough lucidity to satisfy the scholar and the general reader alike. Entries vary in length from relatively brief notices to substantial articles of about 20,000 words. "The Princeton Encyclopedia of Poetry and Poetics," published in 1965, established itself as a standard work in the field. Among the 215 contributors were Northrop Frye writing on allegory, Murray Krieger on belief in poetry, Philip Wheelwright on myth, John Hollander on music, and William Carlos Williams on free verse. In 1974, the Enlarged Edition increased the entries with dozens of new subjects, including rock lyric, computer poetry, and black poetry, to name just a few. 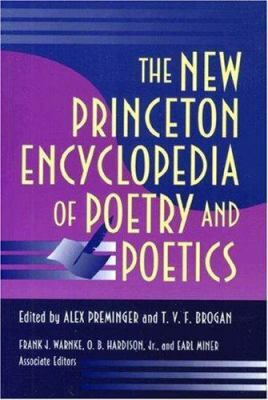 "The New Princeton Encyclopedia of Poetry and Poetics" accounts for the extraordinary change and explosion of knowledge within literary and cultural studies since the 1970s. This edition, completely revised, preserves what was most valuable from previous editions, while subjecting each existing entry to revision. Over 90 percent of the entries have been extensively revised and most major ones entirely rewritten. Completely new entries number 162, including those by new contributors Camille Paglia, Barbara Herrnstein Smith, Elaine Showalter, Houston Baker, Andrew Ross, and many more. New entries include those on cultural criticism, discourse, feminist poetics, and Chicano poetry.Improvements cover several areas: All the recent developments in theory that bear on poetry are included; bibliographies of secondary sources are extended; cross-references among entries and through blind entries have been expanded for greater ease of use; and coverage of emergent and non-Western poetries is dramatically increased. Indeed, a hallmark of the encyclopedia is its world-wide orientation on the poetry of national and cultural groups.